Each vial of Aralast is labeled with the amount of functionally active (alpha) 1 -PI expressed in mg/vial. The formulation contains no preservative. The pH of the solution ranges from 7.2 to 7.8. Product must only be administered intravenously. A clinical study was conducted to compare Aralast (test drug) to a commercially available preparation of (alpha) 1 -PI (Prolastin®), manufactured by Bayer Corporation. All subjects were to have been diagnosed as having congenital (alpha) 1 -PI deficiency and emphysema but no (alpha) 1 -PI augmentation therapy within the preceding six months. Twenty-eight subjects were randomized to receive either test drug or control drug, 60 mg/kg intravenously per week, for 10 consecutive weeks. Two subjects withdrew from the study prematurely: 1 subject receiving Aralast withdrew consent after 6 infusions; 1 subject receiving Prolastin® withdrew after 1 infusion due to pneumonia following unscheduled bronchoscopy to remove a foreign body. Trough levels of serum (alpha) 1 -PI (antigenic determination) and anti-NE capacity (functional determination) were measured prior to treatment at Weeks 8 through 11. Following their first 10 weekly infusions, the subjects who were receiving control drug were switched to Aralast while those who already were receiving Aralast continued to receive it. Maintenance of mean serum (alpha) 1 -PI trough levels was assessed prior to treatments at Weeks 12 through 24. Bronchoalveolar lavages (BALs) were performed on subjects at baseline and prior to treatment at Week 7. The ELF from each BAL meeting acceptance criteria was analyzed for the (alpha) 1 -PI level and anti-NE capacity. With weekly augmentation therapy, a gradual increase in peak and trough serum (alpha) 1 -PI levels was noted, with stabilization after several weeks. The metabolic half-life of Alpha 1 -Proteinase Inhibitor (Human), Aralast, was 5.9 days. Serum anti-NE capacity trough levels rose substantially in all subjects by Week 2, and by Week 3, serum anti-NE capacity trough levels exceeded 11 µM in the majority of subjects. With few exceptions, levels remained above this recommended threshold level in individual subjects for the duration of the period Weeks 3 through 24 on study. Although only five of fourteen subjects (35.7%) receiving Aralast had BALs meeting acceptance criteria for analysis at both baseline and Week 7, a statistically significant increase in the antigenic level of (alpha) 1 -PI in the ELF was observed. No statistically significant increase in the anti-NE capacity in the ELF was detected. Viral serology of all subjects was determined periodically throughout the study, including testing for antibodies to hepatitis A (HAV) and C (HCV), presence of circulating HBsAg, and presence of antibodies to HIV-1, HIV-2, and Parvovirus B-19. Subjects who were seronegative to parvovirus B-19 at enrollment were retested by PCR at Week 2. There were no seroconversions in subjects treated with Aralast through Week 24. None of the subjects became HBsAg positive during the study, although five of 13 (38%) evaluable subjects in the test group and eight of 13 (62%) in the control group had not been vaccinated to hepatitis B. No patient developed antibodies against (alpha) 1 -PI. It was concluded that at a dose of 60 mg/kg administered intravenously once weekly, Aralast and the control (alpha) 1 -PI preparation had similar effects in maintaining target serum (alpha) 1 -PI trough levels and increasing antigenic levels of (alpha) 1 -PI in epithelial lining fluid (ELF) with maintenance augmentation therapy. Alpha 1 -Proteinase Inhibitor (Human), Aralast, is indicated for chronic augmentation therapy in patients having congenital deficiency of (alpha) 1 -PI with clinically evident emphysema. Clinical and biochemical studies have demonstrated that with such therapy, Aralast is effective in maintaining target serum (alpha) 1 -PI trough levels and increasing (alpha) 1 -PI levels in epithelial lining fluid (ELF). Clinical data demonstrating the long-term effects of chronic augmentation or replacement therapy of individuals with Aralast are not available. Safety and effectiveness in pediatric patients have not been established. Aralast is not indicated as therapy for lung disease patients in whom congenital (alpha) 1 -PI deficiency has not been established. Aralast is contraindicated in individuals with selective IgA deficiencies (IgA level less than 15 mg/dL) who have known antibody against IgA, since they may experience severe reactions, including anaphylaxis, to IgA which may be present. Because Alpha 1 -Proteinase Inhibitor (Human), Aralast, is derived from pooled human plasma, it may carry a risk of transmitting infectious agents, e.g., viruses and theoretically, the Creutzfeldt-Jakob disease (CJD) agent. Stringent procedures designed to reduce the risk of adventitious agent transmission have been employed in the manufacture of this product, from the screening of plasma donors and the collection and testing of plasma through the application of viral elimination/reduction steps such as alcohol fractionation, PEG precipitation, solvent detergent treatment, and nanofiltration. Despite these measures, such products can still potentially transmit disease; therefore, the risk of infectious agents can not be totally eliminated. ALL infections thought by a physician possibly to have been transmitted by this product should be reported to the manufacturer at 1-888-675-2762 (US) or 1-323-225-9735 (International). The physician should weigh the risks and benefits of the use of this product and should discuss these with the patient. The rate of administration specified in DOSAGE AND ADMINISTRATION should be closely followed, at least until the physician has had sufficient experience with a given patient. Vital signs should be monitored continuously and the patient should be carefully observed throughout the infusion. IF ANAPHYLACTIC OR SEVERE ANAPHYLACTOID REACTIONS OCCUR, THE INFUSION SHOULD BE DISCONTINUED IMMEDIATELY. Epinephrine and other appropriate supportive therapy should be available for the treatment of any acute anaphylactic or anaphylactoid reaction. Alpha 1 -Proteinase Inhibitor (Human), Aralast, should be administered within three (3) hours after the reconstituted product is warmed to room temperature. Partially used vials should be discarded and not saved for future use. The solution contains no preservative. Aralast should be administered alone, without mixing with other agents or diluting solutions. Animal reproduction studies have not been conducted with Aralast. It is also not known whether Aralast can cause fetal harm when administered to pregnant women or can affect reproductive capacity. It is not known whether alpha 1 -proteinase inhibitor is excreted in human milk. Because many drugs are excreted in human milk, caution should be exercised when Aralast is administered to a nursing woman. Aralast was evaluated for up to 96 weeks in 27 subjects with a congenital deficiency of (alpha) 1 -PI and clinically evident emphysema. The number of subjects with an adverse event, regardless of causality, was 22 of 27 (81.5%). The number of subjects with an adverse event deemed possibly, probably, or definitely related to study drug was 7 of 27 (25.9%). The frequency of infusions associated with an adverse event, regardless of causality, was 108 of 1127 (9.6%) infusions administered per protocol. The most common symptoms were pharyngitis (1.6%), headache (0.7%), and increased cough (0.6%). Symptoms of bronchitis, sinusitis, pain, rash, back pain, viral infection, peripheral edema, bloating, dizziness, somnolence, asthma, and rhinitis were each associated with >/= 0.2% of infusions. All symptoms were mild to moderate in severity. The overall frequency of adverse events deemed to be possibly, probably, or definitely related to study drug was 15 of 1127 (1.3%) infusions. The most common symptoms included headache (0.3%) and somnolence (0.3%). Symptoms of chills and fever, vasodilation, dizziness, pruritus, rash, abnormal vision, chest pain, increased cough, and dyspnea were each associated with one (0.1%) infusion. Five (5) of 27 (18.5%) subjects experienced eight (8) serious adverse reactions during the study. None of these were considered to be causally related to the administration of Aralast. Twenty-six (26) of 27 (96.3%) subjects experienced a total of 94 upper and lower respiratory-tract infections during the 96-week study (median: 3.0; range: 1 - 8; mean ± SD: 3.6 ± 2.3 infections). Twenty-eight (29.8%) of the respiratory infections occurred in 19 (70.4%) subjects during the first 24 weeks of the 96-week study suggesting that the risk of infection did not change with time on Aralast. In a post-hoc analysis, subjects experienced a range of 0 to 8 exacerbations of COPD over the 96-week study with a median of less than one exacerbation per year (median: 0.61; mean ± SD: 0.83 ± 0.87 exacerbations per year). Treatment-emergent elevations (> two times the upper limit of normal) in aminotransferases (ALT or AST), up to 3.7 times the upper limit of normal, were noted in 3 of 27 (11.1%) subjects. Elevations were transient lasting three months or less. No subject developed any evidence of viral hepatitis or hepatitis seroconversion while being treated with Aralast, including 13 evaluable subjects who were not vaccinated against hepatitis B. No clinically relevant alterations in blood pressure, heart rate, respiratory rate, or body temperature occurred during infusion of Aralast. Mean hematology and laboratory parameters were little changed over the duration of the study, with individual variations not clinically meaningful. During the initial 10 weeks of the study, subjects were randomized to receive either Aralast or a commercially available preparation of (alpha) 1 -PI (Prolastin®). Both products were well tolerated with the frequency, severity, and symptomatology of adverse reactions similar in both groups. There were no serious adverse events in the group receiving Aralast. There were two serious adverse events in the control group, one of which was considered to be possibly related to the control drug and included chest pain, dyspnea, and bilateral pulmonary infiltrates. In addition, one subject in the control group became seropositive to Parvovirus B-19. No seroconversions were observed during the entire 96 week study that were attributable to Aralast. No subject developed an antibody to (alpha) 1 -PI. FOR INTRAVENOUS USE ONLY. The recommended dosage of Aralast is 60 mg/kg body weight administered once weekly by intravenous infusion. Each vial of Aralast has the functional activity, as determined by inhibition of porcine pancreatic elastase, stated on the label. Administration of Aralast within three hours after reconstitution is recommended to avoid the potential ill effect of any inadvertent microbial contamination occurring during reconstitution. Discard any unused contents. Aralast should be administered at a rate not exceeding 0.08 mL/kg body weight/minute. If adverse events occur, the rate should be reduced or the infusion interrupted until the symptoms subside. The infusion may then be resumed at a rate tolerated by the subject. Aralast and diluent should be at room temperature before reconstitution. Remove caps from the diluent and product vials. Swab the exposed stopper surfaces with alcohol. Remove cover from one end of the double-ended transfer needle. Insert the exposed end of the needle through the center of the stopper in the DILUENT vial. Remove plastic cap from the other end of the double-ended transfer needle now seated in the stopper of the diluent vial. To reduce any foaming, invert the vial of diluent and insert the exposed end of the needle through the center of the stopper in the PRODUCT vial at an angle, making certain that the diluent vial is always above the product vial. The angle of insertion directs the flow of diluent against the side of the product vial. Refer to Figure below. The vacuum in the vial is sufficient to allow transfer of all of the diluent. Disconnect the two vials by removing the transfer needle from the diluent vial stopper. 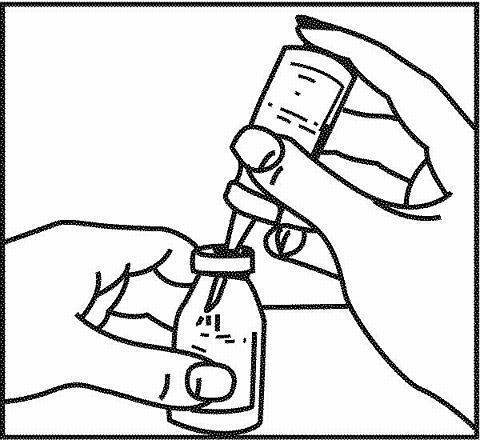 Remove the double-ended transfer needle from the product vial and discard the needle into the appropriate safety container. Let the vial stand until most of the contents is in solution, then GENTLY swirl until the powder is completely dissolved. Reconstitution requires no more than five minutes for a 0.5 gram vial and no more than 10 minutes for a 1.0 gram vial. DO NOT SHAKE THE CONTENTS OF THE VIAL. DO NOT INVERT THE VIAL UNTIL READY TO WITHDRAW CONTENTS. Use within three hours of reconstitution. After reconstitution, inspect product visually for particulate matter and discoloration prior to administration. When reconstitution procedure is strictly followed, a few small particles may occasionally remain. These will be removed by the microaggregate filter. Reconstituted product from several vials may be pooled into an empty, sterile IV solution container by using aseptic technique. A sterile, 20 micron filter spike is provided for this purpose. Alpha 1 -Proteinase Inhibitor (Human), Aralast, is supplied as a sterile, nonpyrogenic, lyophilized powder in single-dose vials. A suitable volume of Sterile Water for Injection, USP diluent is provided (25 mL/0.5 g vial; 50 mL/1.0 g vial). Each vial is labeled with the total (alpha) 1 -PI functional activity in mg. Aralast is packaged with a sterile double-ended transfer needle and a sterile 20 micron filter. Aralast should be stored at 2-8 °C (35-46 °F). Aralast may be removed from refrigeration and stored at temperatures not to exceed 25 °C (77 °F). Product removed from refrigeration must be used within one month. Do not freeze. Do not use after the expiration date printed on the label. Brantly M, Nukiwa T, Crystal RG. Molecular basis of alpha-1-antitrypsin deficiency. Am J Med 1988 (Suppl 6A);84:13-31. Data on file at Alpha Therapeutic Corporation. Crystal RG, Brantly ML, Hubbard RC, Curiel DT, et al. The alpha1-antitrypsin gene and its mutations: Clinical consequences and strategies for therapy. Chest 1989;95:196-208. Crystal RG. (alpha) 1 -Antitrypsin deficiency: pathogenesis and treatment. Hospital Practice 1991;Feb.15:81-94. Hutchison DCS. Natural history of alpha-1-protease inhibitor deficiency. Am J Med 1988;84(Suppl 6A):3-12. Hubbard RC, Crystal RG. Alpha-1-antitrypsin augmentation therapy for alpha-1-antitrypsin deficiency. Am J Med 1988;84(Suppl 6A):52-62. Ogushi F, Fells GA, Hubbard RC, et al. Z-Type (alpha) 1 -antitrypsin as an inhibitor of neutrophil elastase. J Clin Investigation 1987;80:1366-1374. Buist SA, Burrows B, Cohen A, et al. Guidelines for the approach to the patient with severe hereditary alpha-1-antitrypsin deficiency. Am Rev Respir Dis 1989;140:1494-1497. Stoller JK, Brantly M, Fleming LE, et al. Formation and current results of a patient-organized registry for (alpha) 1 -antitrypsin deficiency. Chest 2000; 118(3):843-848.